If you have a lake then you can grow some brilliant Water Lilies (Nymphaea). 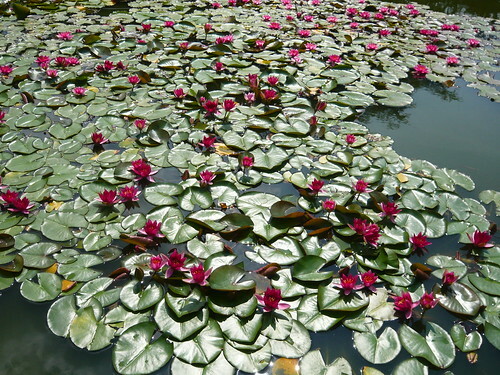 If you have a large pond you can also grow water lilies like those above. 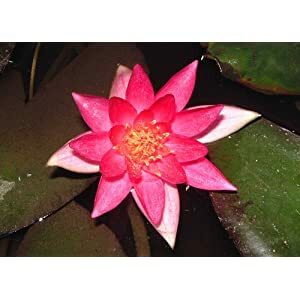 However if you have only a small 6 inch deep area of water you can still grow Nymphaea ‘Pygmaea Helvola’ a small water lily with 3 inch yellow flowers. Dwarf lilies are generally suited to small ponds, while some of the smallest of their kind can safely be used in tubs and half-barrels. They spread 12 to 24 inches and cover 1 – 3 square feet when fully grown. They need a planting depth of around 6 inches and will produce a series of small but beautiful flowers over the summer. Nymphaea ‘Aurora’ – a compact ‘changeable’ variety, suited to tubs as well as small ponds. Nymphaea ‘Paul Hariot’ – another ‘changeable’ it has big flowers for a dwarf variety. Nymphaea pygmaea’Alba’ – a tiny flowering variety ideal for the smallest of water features. Nymphaea ‘Laydekeri’ – various Laydekeri varieties exist that are ideal for even very small ponds. Far from mini a mass of water lilies to admire. Pond life can be enhanced with Marsh Marigolds also known as Kingcup, Mayflower, May-blobs, Water-bubbles and botanically as Caltha palustris. It grows well in wet meadows, marshes, stream sides and wet woodlands. The leaves are kidney shaped and a glossy, deep green. It grows well in shade or partial sunshine and likes damp roots. 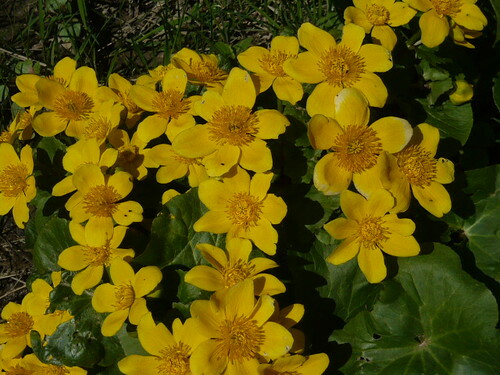 Marsh-marigold can be propagated by sowing fresh seed on a good quality seed compost. Available in aquatic sections of garden centres or from wild seed merchants. Propagated by division in spring, removing some of the larger leaves to reduce water loss through transpiration. Ensure that plants are well watered during the establishment phase. Caltha palustris ‘Flore Pleno’ has double yellow flowers with greeny-yellow centres. Caltha palustris alba is more compact and has single white flowers. 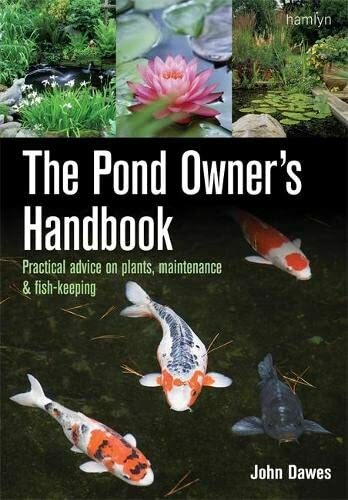 Design your pond so there are shelves around the edge of the pond for shallow and marginal plants. 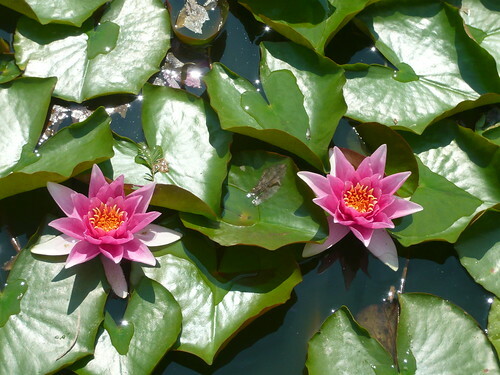 Water Lilies need to be planted at least 18″ deep. If your pond has sheer sides you may want to grow marginal plants by submerging some staging (a weighed down inverted box). This can also be used as an escape route for amphibians to get out of the pond. Keep good pond hygiene by preventing leaves and debris falling in the pond. Every two or three years have a good clean out reintroducing a small quantity of sludge at the bottom to get the process going again. Locate the pond where you can see it preferably in a sunny position well away from any Pine trees. Koi fish need a shaded location. Ornamental ponds may be best located in an elevated position to avoid run off filling the pond. Plant in containers that you can hook out for plant maintenance. You can use a wire coat hanger on a stick if you use a basket with open loops. Invasive plants are constrained by the basket and you can rearrange the planting during the year. Use good garden soil or special compost for planting and put a heavy layer of gravel on the top of the soil. Unconfined plants can look more natural and are often wild life friendly but less showy as ypour best plants need to be containerised. Consider a mix of Deepwater, Floating, Marginal and Oxygenating plants. Deepwater plants like cooler water and the floating leaves create this in a way that supports more life forms and restricts blanket weed. Water hyacinth absorbs pollution particularly from fish waste. Skim off and compost excess plants as they multiply. Bog plants and waterside plants are optional depending on your design and space. For a bog look in drier soil use Hostas and Bearded Iris or Iris Pallida that look like Bog Iris. Lobelia are a lot more than the trailing edge plant associated with Alyssum. Some members of the Lobelia family love water and are happy to be submerged in your pond or pool others like to be planted in moist margins. These Lobelia are the hardy perennial and half hard perennials described below rather than the blue and white annuals we grow as children. Flowers in glorious blue to purple and has elegant lance shaped leaves growing to 2 feet tall and making a tight clump. Plant in soil and in up to 2 inches of water and propagate by division. It should not need special winter protection. 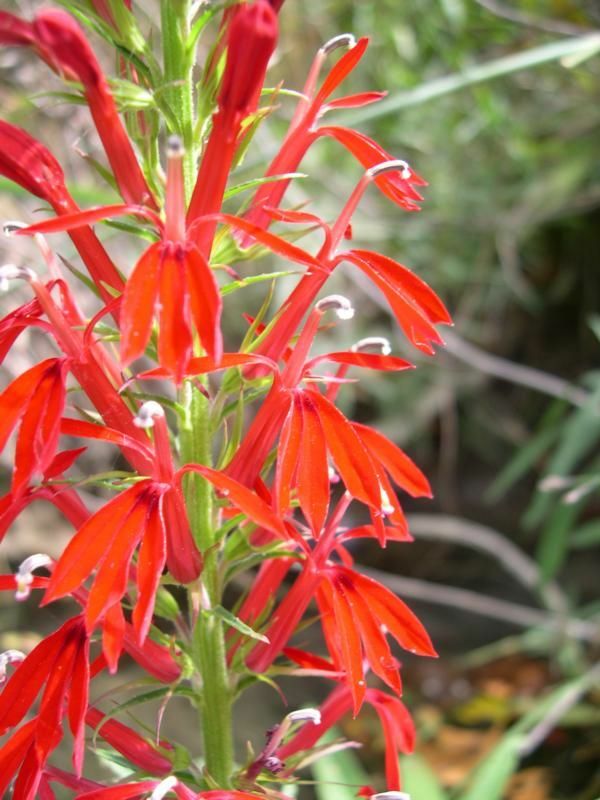 The cardinal flower has striking dark red foliage made even more spectacular by a profusion of scarlet flowers in August. The 3 feet high plants may need staking and in winter they should be moved to drier conditions so it is best to plant in a deep planting basket. The plants like moist soil and semi-shade when growing . They work well with Hostas for contrast in shape and colour.